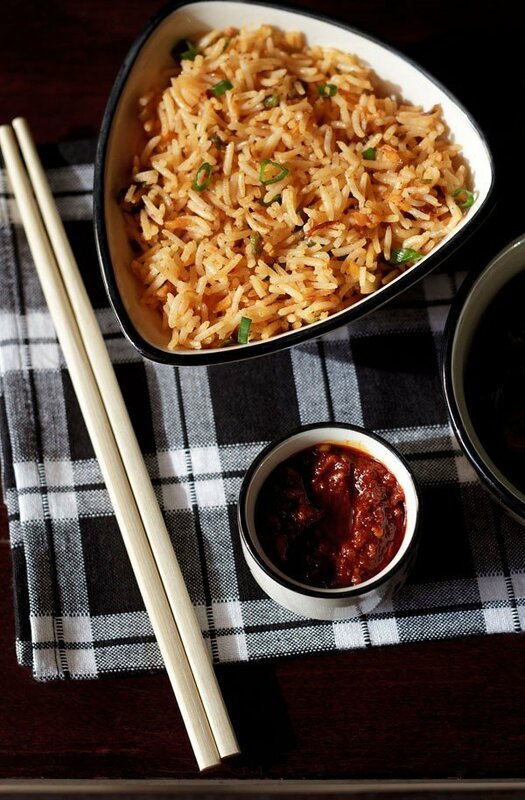 schezwan sauce an indo chinese fusion recipe. 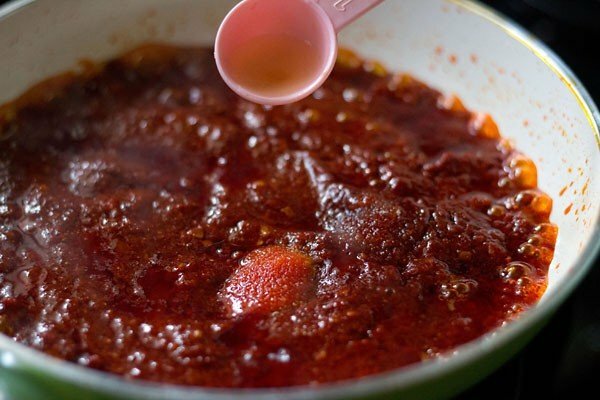 hot, spicy schezwan sauce to perk up your meals. 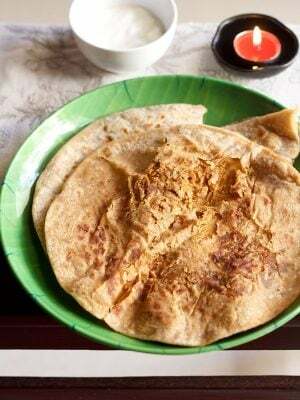 schezwan sauce recipe with step by step photos – a fusion indo chinese recipe of a spicy and hot chili sauce. 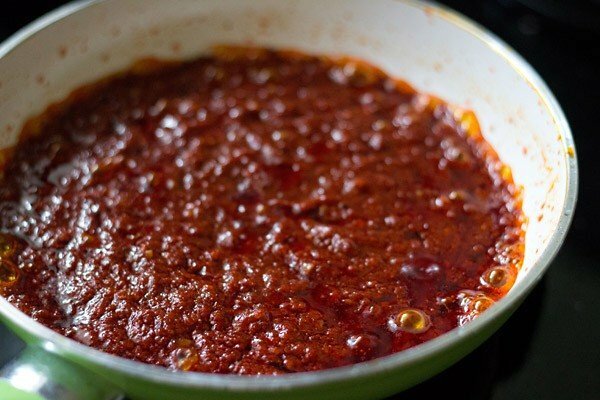 the chilies added in this schezwan sauce are dry red chilies, besides lots of garlic and bit of shallots. schezwan sauce can be served as condiment with snacks like potato wedges or veg cutlet, french fries, spring roll and veg momos. 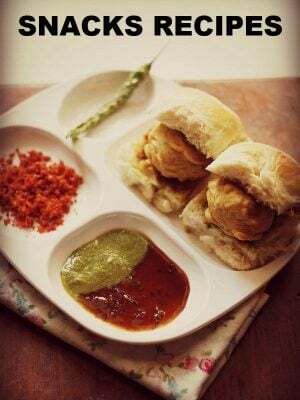 even with the indian pakoras, the sauce goes amazingly well. whenever i plan to make schezwan fried rice or any other schezwan based dish, a day before i make the sauce. 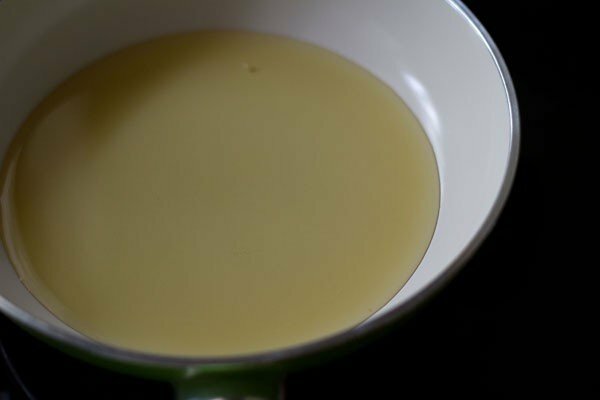 if you add more oil than what is mentioned in the recipe and keep a bit of oil floating on the top, the sauce has a longer shelf life. 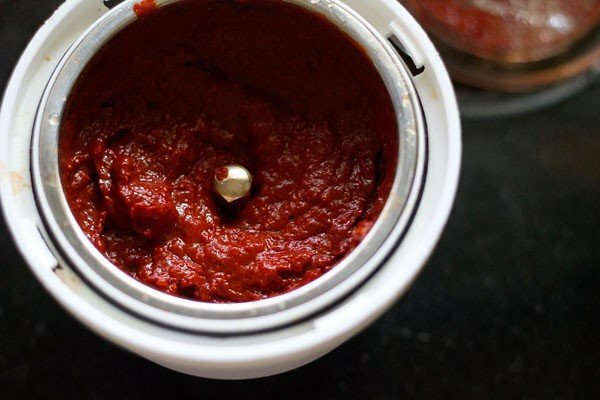 after adding the sauce to all the recipes, i make, the remaining sauce is served as a condiment to go with snacks. 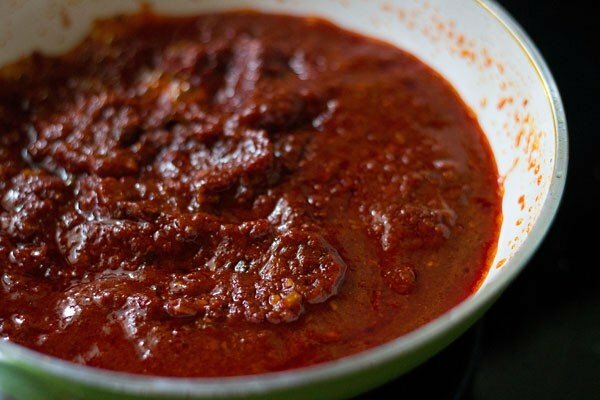 the schezwan sauce stays good in the refrigerator for about 2 to 3 weeks. 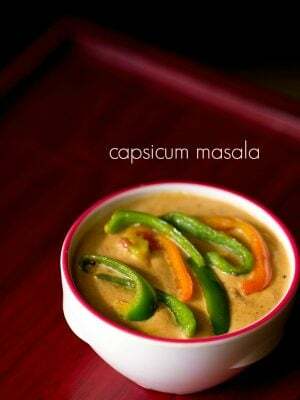 i have used a mix of the mildly hot indian variety of kashmiri red chilies and byadagi chilies. they give a good color, flavor and taste good too. 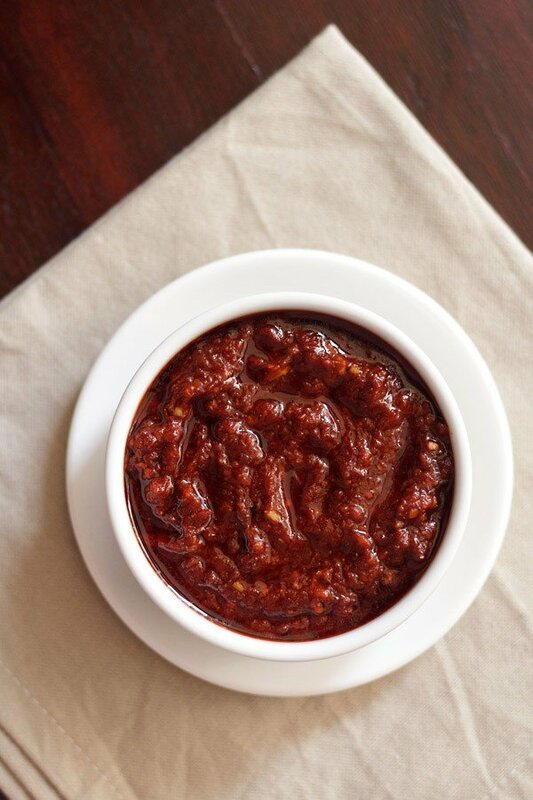 depending on your taste buds and spice tolerance, you can choose chilies with low heat or medium heat. usually, i add celery to the schezwan sauce. but this time, my celery plants could not survive the heat in the summers. but if you have celery, then do add them to the sauce. 1 to 2 teaspoon organic unrefined cane sugar or brown sugar - please add as required. for a more sweeter taste, you can even add up to 3 teaspoon sugar. 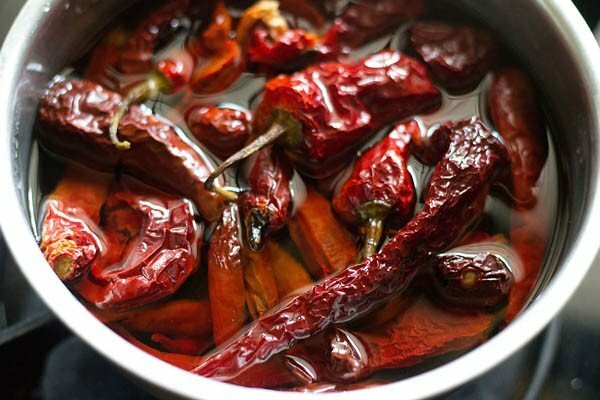 rinse and then soak the chilies in hot water for 30 minutes. you can also de-seed the chilies before you soak them. drain. remove the stems and then break the chilies. 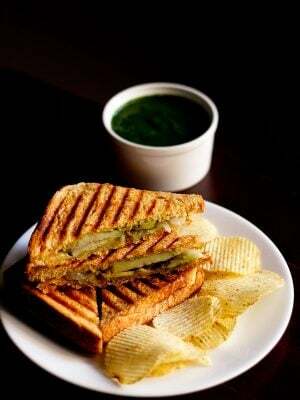 add them to a chutney grinder or blender. 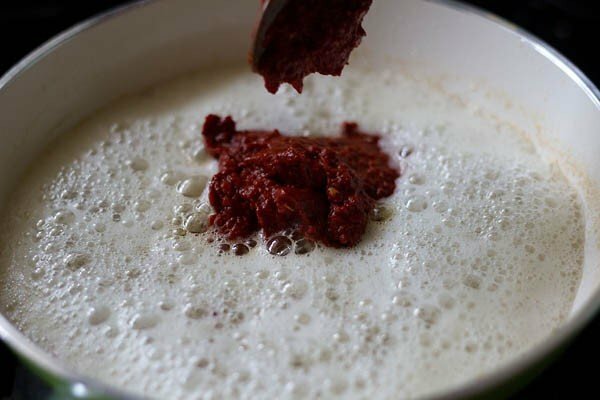 add water and make a smooth paste of the red chilies. 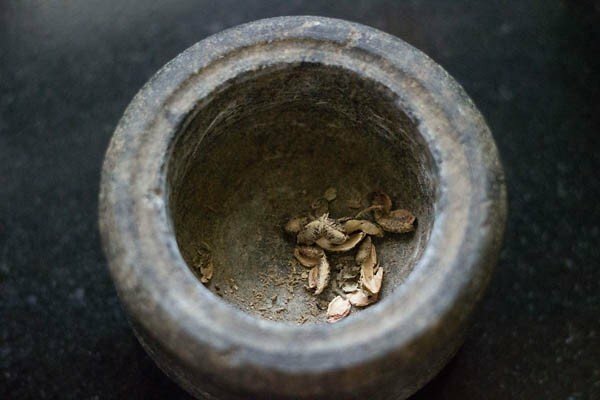 crush the sichuan peppers coarsely in a mortar-pestle. heat sesame oil or any other vegetable oil in a pan. add the garlic and ginger first and saute till their raw aroma goes away. don't brown them. add the chopped shallots and then saute them till translucent. add the ground red chili paste and stir. then add the crushed sichuan pepper. saute for 1 to 2 minutes more till you see oil from the sides of the sauce. add 1/2 cup of water and give a stir again. simmer for 2 mins. add salt, pepper, soy sauce and vinegar. also add celery now, if using. stir and continue to cook for 5 to 6 minutes more. 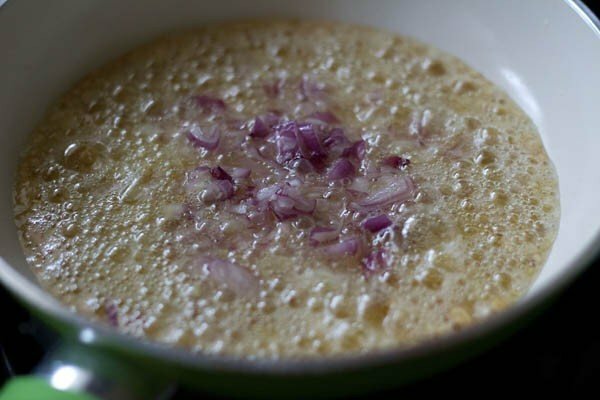 check the taste of schezuan sauce and add more salt, sugar or pepper as required. 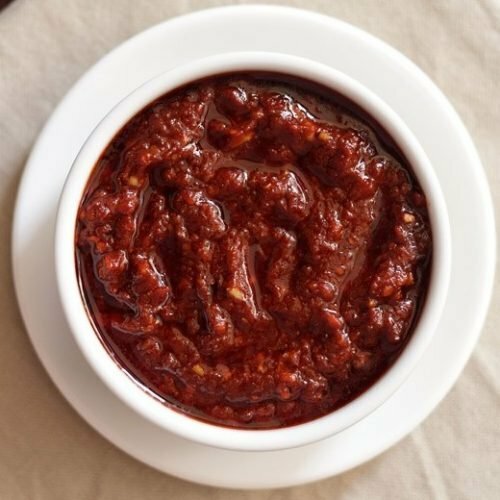 once the schezuan sauce cools down collect it in a small jar or bowl. 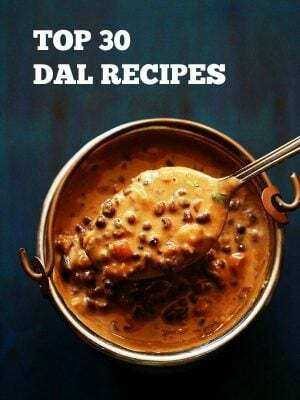 cover tightly with a lid and refrigerate. 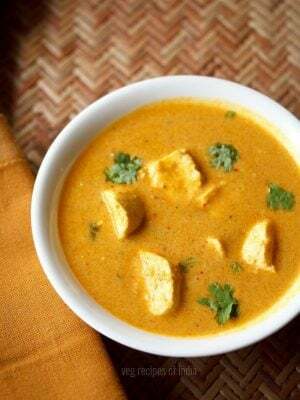 serve schezwan sauce as a condiment with snacks or you can also add in recipes like schezwan fried rice or noodles, vegetable schezwan or veg balls in hot garlic sauce. 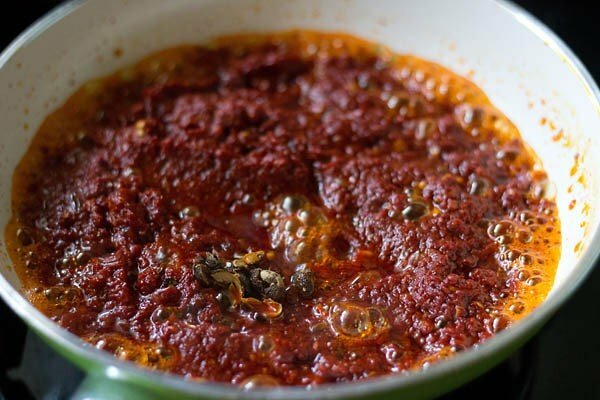 the schezwan sauce stays good for about 2 to 3 weeks in an air-tight container in the refrigerator. 1. rinse and then soak the chilies in hot water for 30 minutes. you can also de-seed the chilies before you soak them. 2. drain and then remove the stalks. break the chilies. add them to a chutney grinder or blender. 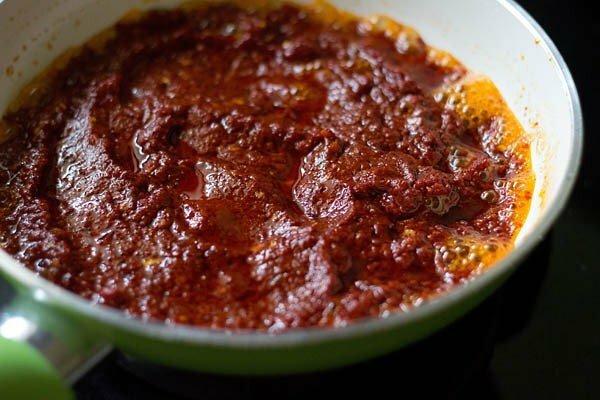 3. add water and make a smooth paste of the red chilies. 4. crush the sichuan peppers coarsely in a mortar-pestle. keep aside. if you do not have sichuan peppers, then skip them. 5. heat sesame oil or any other vegetable oil in a pan. 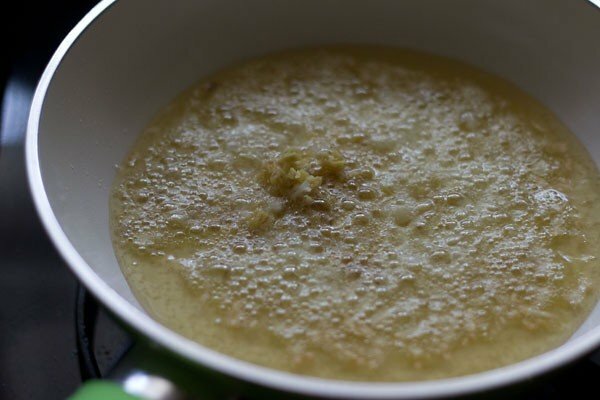 6. add the garlic and ginger first and saute till their raw aroma goes away. don’t brown them. 7. add the chopped shallots and then saute them till translucent. 10. then add the crushed sichuan pepper. 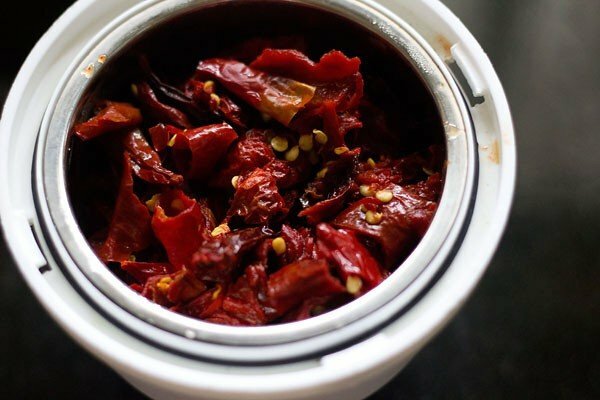 if you don’t have sichuan peppers, then just skip this step. 11. saute for 1 to 2 minutes more till you see oil leaving the sides of the sauce. pour water and give a stir again. 12. simmer for 2 mins. 13. add salt, pepper, soy sauce and vinegar. stir and continue to cook schezuan sauce for 5 to 6 minutes more. 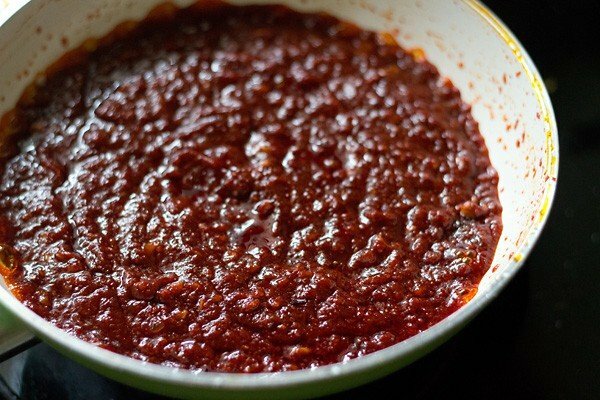 14. once the schezwan sauce cools down collect it in a small jar or bowl. cover tightly with a lid and refrigerate. 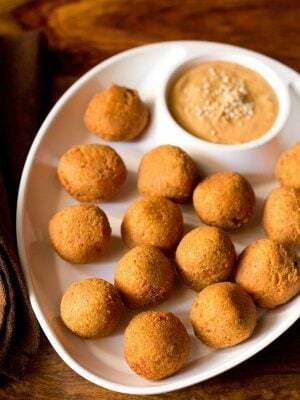 15. serve schezwan sauce as a condiment with snacks or you can also add in recipes which requires schezwan sauce. thanks rashmi for this lovely comment. glad to read it. thanks again and happy cooking. How may garlic should one use if they’re the bigger ones ? Where is live at the garlic pods are really big. Should I still be using 15 pieces of garlic then ? take about 6 to 7 garlic pods then.